Your living room is where you live, relax, and enjoy company. It should be welcoming, warm, and comfortable. 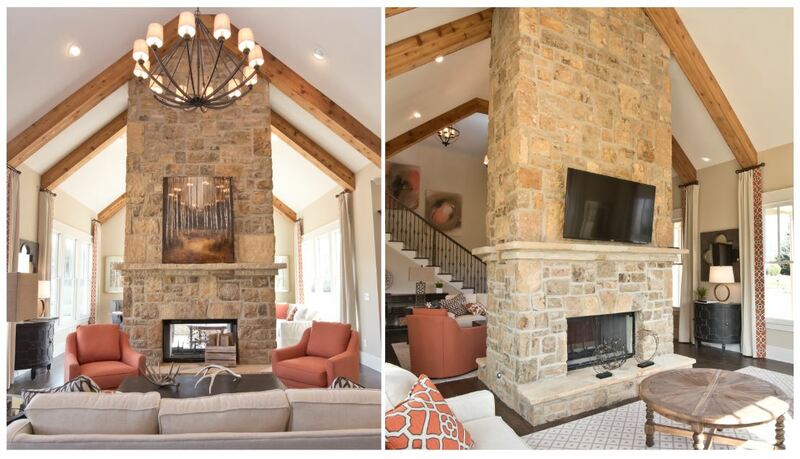 In a Brock Built home, you can achieve all this by starting with one focal point: the fireplace. Our homes are built with families in mind, which is why each home is constructed with both style and a strong foundation. This winter, be inspired by these four spaces to warm your home with fireplace decor. A double-sided fireplace, like this one in Adams Vineyard, is perfect for larger gatherings. It also gives you more room to experiment with different furniture options. With a wrap-around mantle, one side can house your tv facing comfy, casual couches for everyday lounging. The other side can feature a large piece of artwork to compliment a more formal sitting area. 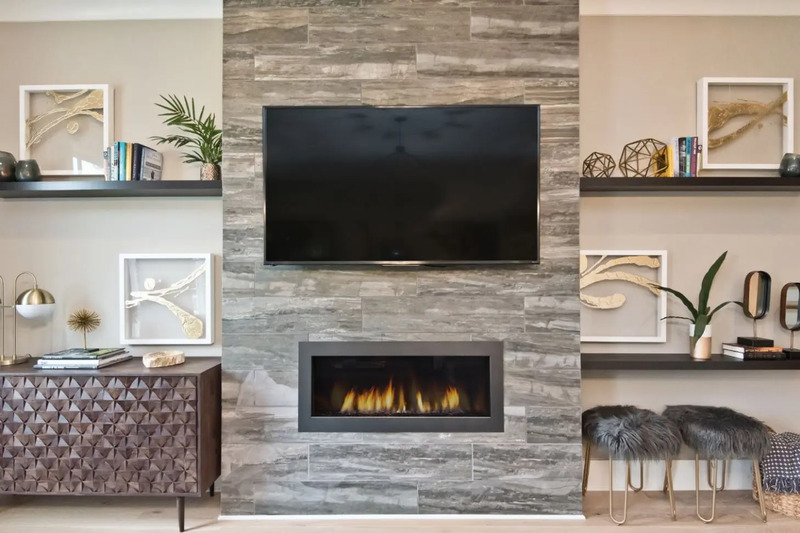 With the large rock design and virtually no wall space to cover, the fireplace serves as a decor piece in itself, so most of the work is done for you! Patterns are a great way to make your fireplace a dynamic piece of your living room. With variations of white shiplap and herringbone marble tile, this West Highlands home makes the fireplace a foundation for the room’s bright, geometrical design. The wood mantle adds a simple divide between the two material patterns and pulls together the brown furniture pieces in the room. A light and neutral color scheme can make your home ready for any seasonal decor, especially shades of green and red for the holidays! If you have a more contemporary home, your fireplace may not allow mantle-top decor. Like this bold fireplace in the new Westside Station model home, the space on either side is where smaller decorations preside. Built-in bookshelves create an expansive opportunity for symmetry and storage, leaving room for solid color furniture. Modern decor with sharp edges compliments the smooth tile whilst leaving the fire and television the stars of the show. The dark tile naturally draws attention, so any decor should be complimentary. Metals and grays also go well with this fireplace feature. Natural light and a rugged white stone fireplace are the perfect combination for a cozy cottage aesthetic. Cream, gray, and wood accents give your home a clean, rustic feel. In the winter, a warm getaway like this living room in West Town is ideal! 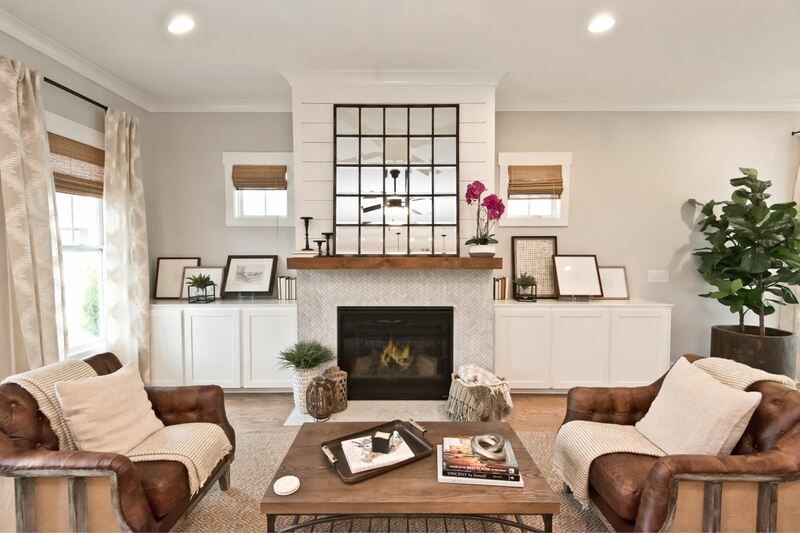 A few statement plants, assorted neutral lanterns, and a large framed piece of art make the fireplace less of a focal point and more of an essential addition to this cozy corner. With a few knit throw blankets and hot chocolate, this living room is ready for a warm fireside night in. Snuggling up by the fire on your mind now? You can find your winter escape in any of our Brock Built homes this season. You can save big this holiday season with reduced prices on select homes if you close by December 31. Come visit any of our model homes or contact us to let us help find your family a warm place to call home this season!